Organizations use the Flaremap Platform to build “third-generation” visual applications. 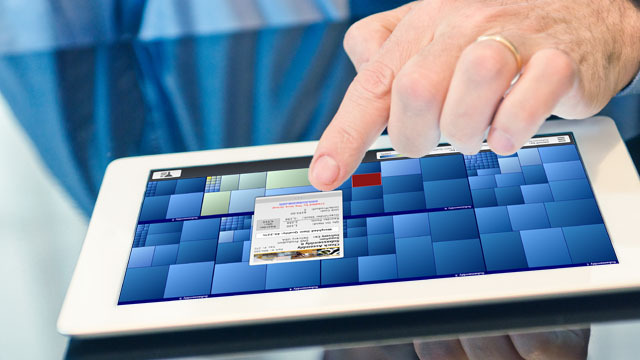 Flaremap applications embrace the underlying processes, supporting users as they do their jobs. The Flaremap Platform is a flexible framework that delivers data-dense, operational applications. Discover some of the powerful features offered in the Flaremap Platform. Flaremaps power operational applications by driving anomalies to the surface. Cells represent the underlying data. Each cell represents an individual item or record. Cells can be grouped, sized, and colored using the controls panel, allowing for multi-dimensional sorting and analysis. A filters panel allows the user to filter, zoom, and search, controlling which data elements are displayed. Hovering over a cell reveals an information box, providing custom metrics and specific user actions appropriate to that cell. Flaremap is a registered trademark and registered service mark of Visual Action Software, Inc.
Flaremap Studio, Flaremap Rich, Flaremap JS, and Flaremap Thin are trademarks of Visual Action Software, Inc.
All marks, products, and/or service names and symbols mentioned herein are trademarks and are the property of their respective owners.